For 25 out of the last 29 years, the Johns Hopkins Hospital has been rated as the nation's best hospital by US News and World Report. 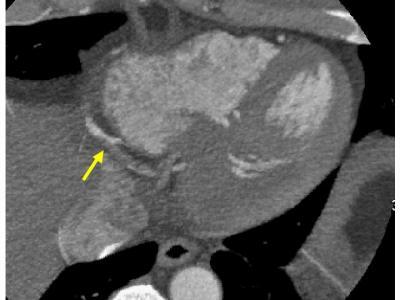 The Johns Hopkins Cardiac CT Practicum includes instruction in the acquisition of cardiac CT data through participation in scanning "live cases". Founded in 1773, the Johns Hopkins Bayview Medical Center is one of five member institutions in the Johns Hopkins Health Systems, and has a long, distinguished history of service and medical excellence. Welcome to JHU's Cardiac CT Training Site! 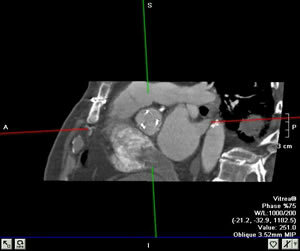 Cardiac CT has been utilized as a clinical, research, and teaching tool at Johns Hopkins since February, 2003, with first 16, then 32, 64, and now 320 detector scanners in use at Johns Hopkins Bayview Medical Center and Johns Hopkins Hospital. We have gathered a broad experience in CT image acquisition and interpretation, and have imaged thousands of patients with a wide range of indications and findings. CT research at Johns Hopkins has focused on clinical correlations, image acquisition techniques, plaque imaging, perfusion, viability, and other issues. Active CT teaching programs have been ongoing since late 2003; the faculty has developed expertise in teaching techniques of CT interpretation and has trained over 1200 physicians in a wide variety of programs meeting criteria for ACC/AHA Level I, II, and III certification. Welcome to this site, which is devoted to our various teaching programs. Click here for more information about our Level 2/3 training program, or contact us to discuss weter our CT course wll meet your needs. Why does this young man with chest trauma have elevation of troponin? Answer: There is occlusion of the right posterolateral artery. What is a potential cause of post-exercise syncope in this young man? 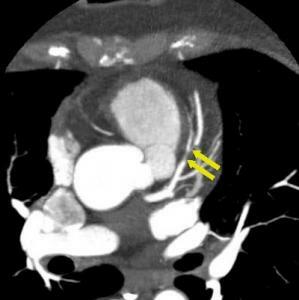 Answer: Anomalous origin of the RCA, coursing between aorta and pulmonary artery. This 34 yo woman had atypical chest pain. Comment on plaque characteristics. Answer: There is positive remodeling and spotty calcification. The extent of disease can be quantified using special software. Low density plaque is highlighted in red, intermediate density plaque in blue, and calcified plaque in yellow. Which vessel is anomalous? Is there a risk of sudden death? Answer: LAD. No, it is not between Ao and PA. This 70 year old woman with a calcium score of zero complains of chest pain. What is the abnormality? 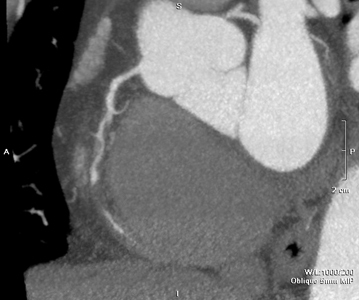 Answer: Severe stenosis in proximal LAD. 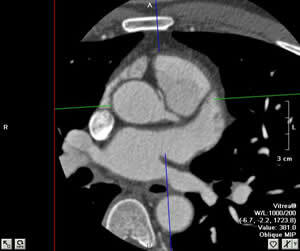 Why did this 68 year old man do poorly after replacement of aortic valve with a porcine bioprosthesis? Answer: There is a spiculated lung mass which turned out to be lung ca. Why is the RV enlarged? Where is this LAD location likely to be more severe, A or B ? 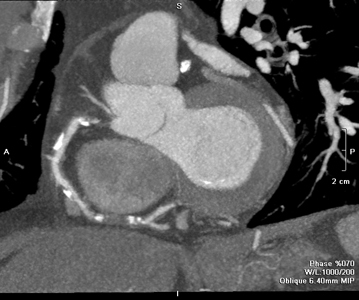 Answer: A; calcification exaggerates the stenosis. Why does the patient have CHF with normal LV function? Answer: He has constrictive pericarditis. This 27 yo's father had MI at age 27. He adheres to a healthy lifestyle. Has he dodged the genetic bullet? Answer: No. There is non-obstructive disease in the LAD. 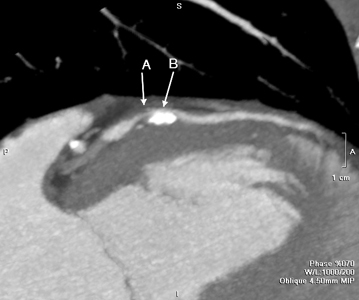 What is in the left atrial appendage in this woman with AF? Answer: There is no thrombus. This is artifact due to LA stasis. Why are there runs of non-sustained VT? 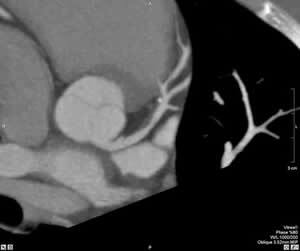 Answer: There is a focal lateral aneurysm due to cardiac sarcoidosis. 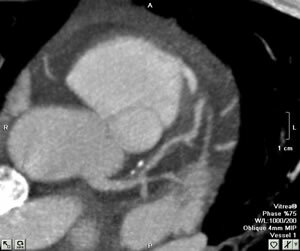 How severe is the lesion in the distal RCA? Why does this 52 yo TSA agent has CP while X-raying your luggage? 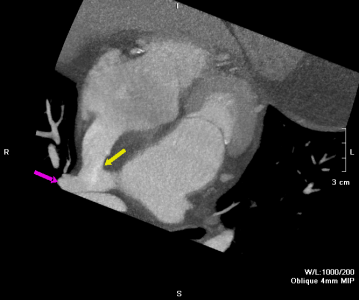 Answer: His RCA is occluded.